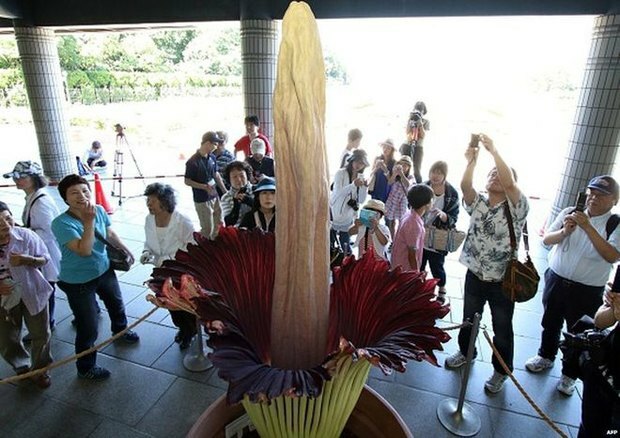 A gross, giant flower said to be the world's largest has bloomed at a Tokyo park for the first time in five years. The wrinkly, shriveled phallic flower stands 6.5 feet tall and stinks like rotting meat. The flower, Amorphophallus titanum, is commonly known as the corpse flower due to its horrific aroma. 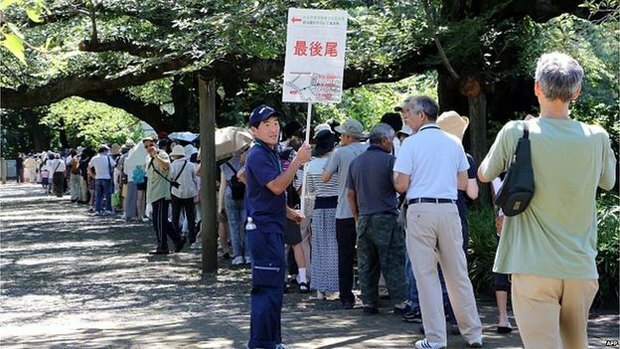 The smell of dead animal attracts pollinators - and tourists - apparently. The flower is notoriously difficult to propagate and has been classified by the International Union for Conservation of Nature as "vulnerable" - one level below endangered. The flower's latin name is Amorphophallus titanum which comes from Ancient Greek. Amorphos means "without form, misshapen;" phallos means "phallus"; and titan means "giant." The corpse flower is native to western Sumatra, where it grows in openings in rainforests on limestone hills. The plant generally needs 7-10 years of growth before it can bloom. Three to ten years pass in between each blooming, which only lasts a couple of days.